In the late 1970’s Ross began a 24-year stint with the New York office of NM Rothschild & Sons where he ran their bankruptcy-restructuring advisory practice. Around that same time Atlantic City, NJ legalized gambling. By 1984 President Donald Trump opened his first casino in Atlantic City. Harrahs at Trump Plaza was financed and managed by Holiday Corporation, a British-owned hotel chain better known as Holiday Inn. The parent company of Holiday Inn is Intercontinental Hotels Group (IHG). Both are headquartered at Denham, Buckinghamshire in the UK. IHG owns 0ver 5,000 hotels in over 100 countries including Candlewood Suites, Crowne Plaza, & Staybridge Suites. 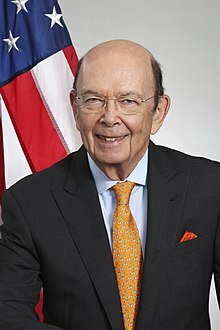 When the purchase put Trump in financial hot water, it was bond specialist Wilbur Ross at NM Rothschild & Sons who in 1992 convinced Trump’s creditors to write off billions of Trump’s debt in exchange for casino assets. In 2000 Ross founded the private investment fund WL Ross & Co. based on a distressed assets fund he had started at NM Rothschild. The company began buying up the shares of bankrupt US Steel companies like LTV, Bethlehem, Weirton & Acme. They folded these assets into International Steel Group (ISG) while promising United Steel Workers union workers they were going to save their jobs. But in 2005 Ross sold ISG to the Luxembourg-based Indian-operated ArcelorMittal Steel, which began cutting 45,000 steelworker jobs in the US. Ross, who learned this vulture finance capitalism model at Rothschild, had just exported virtually the entire US steel industry to India. By 2006 WL Ross & Co. became a subsidiary of Invesco, Ltd & Wilbur Ross became Invesco CEO. Invesco set up domicile in the City of London-controlled off-share haven of Bermuda. I’s owner was the London-based Britannia Arrow, which also owned Montagu Investment Management. Samuel Montagu was a prominent Zionist banker in London and his namesake bank was one of five that met until 2007 at NM Rothschild in London to “fix” the price of gold. In 1997 Invesco bought AIM Investments. In 2007 Invesco moved its headquarters from London to Atlanta and began buying up various investment funds including Morgan Stanley’s retail business, Van Kampen Investments, Guggenheim Investments, and Oppenheimer Funds. By 2018 Invesco had $937 billion under management. But it was Ross’s 2012 Invesco purchase of NBNK which leads down the darkest alley. NBNK was founded in 2010 by City of London insiders including Lord Peter Levene. Levene was educated at the City of London School for boys, which is funded by City’s Cash and is part of the Crown’s Headmasters’ and Headmistresses’ Conference. Levene served as both alderman and sheriff for the City of London before becoming Lord Mayor in 1998. He worked at United Scientific Holdings Plc. for 20 years and became its chairman. This British defense contractor was eventually absorbed into Crown Agent BAE. In the 1980’s Levene became Personal Advisor to the UK Ministry of Defence, then spent six years as a Permanent Secretary in his role as Chief of Defence Procurement. In 1989 he became Knight Commander of the Order of the British Empire and his banking career began. He worked at Morgan Stanley before serving as chairman of Banker’s Trust and vice-chairman at Deutsche Bank. He chaired Lloyd’s of London from 2003-2011 after serving as Lord Mayor of the City of London Corporation from 1998-1999. Currently, Levene chairs Starr Underwriting Agents Ltd. and sits on the boards of General Dynamics UK, China Construction Bank, Eurotunnel and Haymarket Media Group. Another NBNK insider was Sir David Walker, former chairman at Reuters, Morgan Stanley and Barclays. Walker had served as assistant UK Treasury Secretary, chair of the Securities & Investment Board and was the executive director for finance and industry at the Bank of England. He was deputy chairman at Lloyd’s Bank and in 1994 joined the Washington DC-based Rockefeller Foundation-created Group of Thirty. Ross became Chairman of NBNK while Sir David Walker became vice-chair. Walker was also on the Board at the UK IP Institute. A fellow board member was Sir Robin B. Nicholson who founded SERCO with Sir Geoffrey E. Pattie. The IP Institute is the equivalent of the US Patent Office. NBNK funneled money from Goldman Sachs and British aristocrats into the Facebook IPO, which went public on May 18, 2012. NBNK announced that it would be wound down less than one month later on June 27, 2012. This entry was posted in Features and tagged BIG OIL & THEIR BANKERS, City of London, Crown Agents, Facebook, Illuminati Agenda 21, Lord Levene, SERCO, Sir David Walker, STICKIN' IT TO THE MATRIX, THE FEDERAL RESERVE CARTEL, THE GRATEFUL UNRICH, US Patent Office, Wilbur Ross. Bookmark the permalink. Yes Jerre, a big wow, all roads lead to the City of London, to their agents. It’s always the Crown and their agents everywhere, not just in the Commonwealth countries or the States, but they are infiltrated in every European country’s government as advisers, and in banks. Rothschild banking cartel/Black nobility keeps its power this way by controlling their agents/minions. That is what people need to understand and connect the dots and be united to fight them. Awesome article Dean as usual connecting all the dots, a pleasure to read. Dean: reading what’s not written in media: Once Jerualem becomes (according to US) Israel’s capital, Stormy Daniels stops compensation claims. Mueller exonerates Trump from suspicious Russian contacts. Kushner: a well-compensated suspicious “crown” contact. Nice article, thank you Dean. Thanks Roger & your reading between the headlines is spot on! really fascinating, Dean. I love all your work. Is your information documented somewhere? It would help to see your documentation. Without it, it’s hard to pass on your important research to more skeptical type people.